Kansas City, Mo. 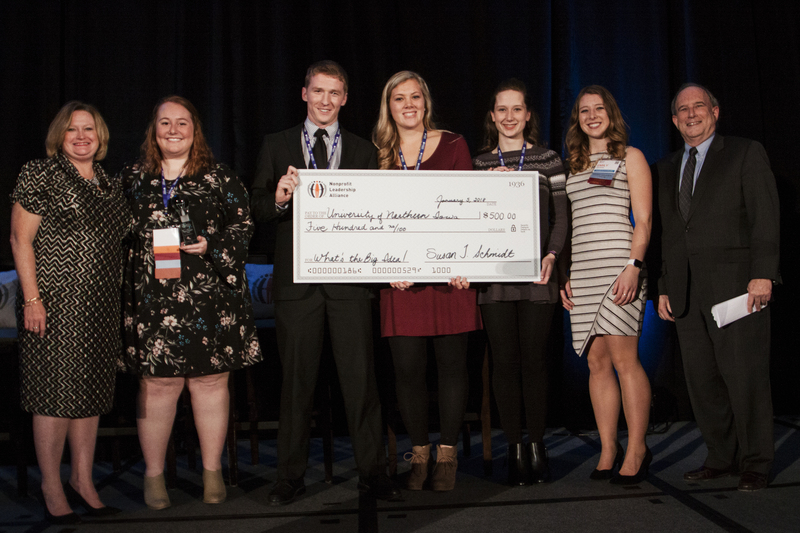 – The Nonprofit Leadership Alliance recently presented a group of students from the University of Northern Iowa with the inaugural “What’s the Big Idea?” Award, sponsored by KPMG. The awards presentation took place at the annual Alliance Management Institute—an educational conference geared toward students planning a career in the nonprofit sector. The 45th annual Institute was January 3-5, 2018, at the Kansas City Marriott Downtown. The “What’s the Big Idea?” Award recognizes a group of Alliance students seeking the Certified Nonprofit Professional (CNP) credential who have created an innovative solution to address a major challenge facing the nonprofit sector. The 2018 student groups focused on diversity, equity and inclusion in the nonprofit sector. Finalists from three Alliance campuses, Kennesaw State University, University of Northern Iowa and Arizona State University, presented their “Big Ideas” in front of a panel of judges and the 500 AMI attendees during the opening ceremony on Wednesday, January 3, 2018. University of Northern Iowa students Trevor Schmitt, Maddie Christensen, JD Waybill, Emily Dvorak and Morgan Rahe were presented with the award during the closing awards ceremony on January 5, 2018. About KPMG LLP: KPMG LLP, the audit, tax and advisory firm (www.kpmg.com/us), is the independent U.S. member firm of KPMG International Cooperative (“KPMG International”). KPMG International’s independent member firms have 189,000 professionals, including more than 9,000 partners, in 152 countries. About the Nonprofit Leadership Alliance: Since 1948, the Nonprofit Leadership Alliance has worked to strengthen the social sector with a talented, prepared workforce. Its Certified Nonprofit Professional (CNP) credential is the only national nonprofit management certification in the U.S. The Alliance system, which includes nearly 40 colleges and universities, 15 national nonprofit partners and more than 10,000 CNPs, is the largest network in the country working to build a talent pipeline for the social sector.